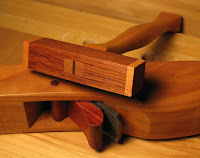 When a friend watched me set both the iron and the wedge on one of my handmade planes with a metal mallet, he said "You're supposed to use a wood mallet to tap the wedge and plane body." "Yeah. Well, I sort of like the tool marks on the backs of my planes," I insisted. He gave me a look that said he knew I was bluffing; that I really had no idea you should switch mallets mid-adjustment. I've been abusing my planes this way for years and they have the half moon marks to prove it. I've even all but obliterated my name on one of them. Little wood mallets come in handy for more than just plane adjustment s. They're also helpful with driving in & removing the wedges from tusk tenons, and joining dovetails & finger joints. And it was high time I made one. The element that's lost in small wood mallets, though, is weight on the hammer end. So I chose to make the handle from cherry and the hammer head from rosewood. Rosewood is heavy and dense, which can damage a project in use, so I decided to buffer the blow with cherry pads glued to each end. I referred to a tack hammer's handle as a template, rough cut the blank on the bandsaw, and finalized the shape with a sanding drum chucked into my drill press. 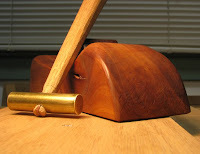 A wedged through-tenon is an effective way to secure the hammer head to the handle. 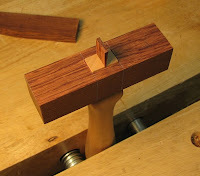 First, drill a hole at the lower end of the tenon so it won't split when you drive the wedge in. Then saw a kerf down the middle of the tenon. 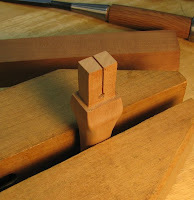 The 6th photo shows the [slightly] loose-fit tenon that provides wiggle room for the wedge. 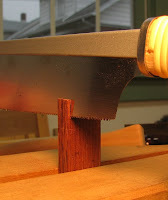 Cut the wedge with your tool of choice; I used a Japanese dozuki. Add glue to the tenon, mortise, and wedge, and then hammer the wedge home. Two cherry pads and three coats of Watco Wipe On Poly later, and my wood mallet and handplanes are playing nicely together. And I can finally remit my H.A.A. (Handplane Abusers Anonymous) member card.